Turkey's ruling Islamic-rooted party is likely to need a coalition partner to form the next government after getting hit with surprisingly strong losses in a national vote, yet other parties vowed Monday to resist any such pact. President Recep Tayyip Erdogan's Islamic-based Justice and Development Party, known as the AKP, won less than 41 per cent of the vote in Sunday's election for Turkey's 550-seat parliament. It was projected to take 258 seats, still top of the political heap but 18 seats below the minimum required to rule alone. The results dealt a direct slap to Erdogan, who had hoped to reshape Turkey's democracy into one in which his more-powerful presidency — not the parliament — would wield most control of government affairs. Erdogan, Turkey's dominant political figure who served as prime minister from 2003 to 2014, had personally campaigned for the AKP in hopes of boosting the party's 327 seats. "The dictator has collapsed," proclaimed the Yurt newspaper headline Monday. Some voters were angry that Erdogan had ignored the law requiring him to be neutral. "In a country where the president is supposed to be independent, the president was out in the field. ... He wanted to be the only one in power, and the people did not give him permission," said Istanbul resident Zeki Altay, who hoped the opposition parties would unite against the AKP. Prime Minister Ahmet Davutoglu of the AKP convened his cabinet Monday to chart the most likely course to remain in power, whether by coaxing a reluctant opponent to the table or by trying to rule alone in a parliament where the AKP will be outnumbered by three empowered rivals. Erdogan appealed for national unity and for political foes to come together to safeguard what he called "the gains made from stability and environment of trust in our country." In a statement Erdogan, 61, conceded that his party needed a partner and could not run a stable minority government. The result, he said, "does not allow any party the possibility to govern alone" and required "a healthy and realistic assessment by all parties." The AKP's surprise loss of parliamentary control looks likely to undermine Erdogan's ambitions to make Turkey a dominant regional power. The result also casts doubt over Erdogan's leadership of two years of peacemaking efforts with Kurdish leaders seeking to end a decades-old conflict that has cost tens of thousands of lives. Investors took fright at the potential loss of a one-party government. Turkey's currency slumped 5 per cent to a record low of below 2.8 lira to the U.S. dollar, the stock market in Istanbul tumbled 8 per cent, and the yields on Turkish government 10-year bonds surged nearly a full point to 10 per cent. The AKP government could remain for a few months before a new government is formed or, in the event of failure, a new election is called. The official results are expected to be certified within two weeks. Once all lawmakers take their oath of office, all parties will have 45 days to negotiate a new governing alliance. But analysts say prospects have been soured by the divisive campaigning tactics of Erdogan who led fierce, partisan attacks on rival parties. Those parties — the centre-left Republican People's Party (CHP), the right-wing Nationalist Movement Party (MHP) and the pro-Kurdish voice of the People's Democratic Party (HDP) — all said Monday they would not prop up an AKP-led government. The government's deputy prime minister, Numan Kurtulmus, told reporters Monday he was confident that his party would form a coalition with one of the other three. He called the idea of a new election a "distant possibility." 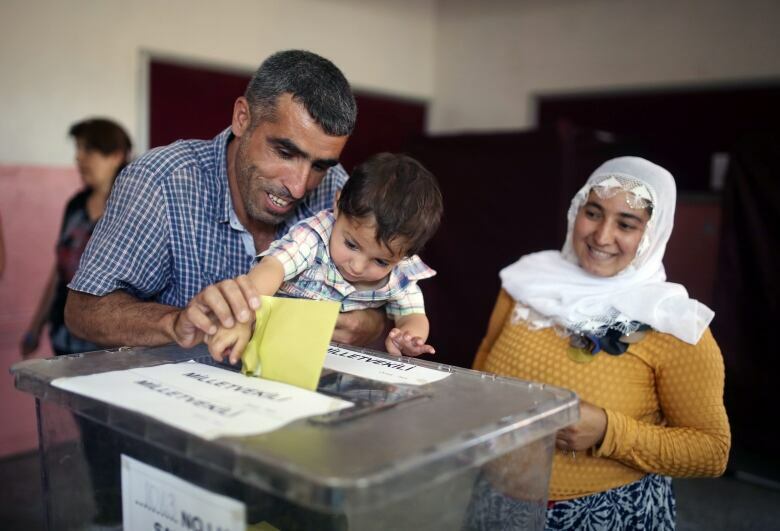 The biggest change from Turkey's previous parliament is the ascendancy of the People's Democratic Party, a socially liberal force rooted in the Kurdish nationalism of Turkey's southeast. It attracted more than 12 per cent of votes and is expected to win 80 seats. Analysts said that breakthrough did the most damage to the AKP's hopes, and the People's Democracy leader said he had no intention of saving the government now. "We have promised our people that we would not form an internal or external coalition with the AKP," said Selahattin Demirtas. "We are clear on that." The party that finished second with a projected 132 seats, the Republican People's Party, called for other opposition parties to help it force the AKP from power. But such an alliance would have to reconcile the anti-Kurdish conservatives of the Nationalists with the growing political voice of Turkey's Kurdish minority. On paper, the Nationalists with 16 per cent of votes and 80 seats appear closest in ideology and temperament to the AKP. But their leader, Devlet Bahceli, also is arguing that voters want the AKP out of power, even if that means running another election within months. "Nobody has the right to sentence Turkey to an AKP minority government," Bahceli said. "Whenever there can be early elections, let them take place."